Photo: A student participates in the kangaroo jump. School children reluctantly part with company volunteers. December brought cold Siberian winds to Beijing, China; but despite the bitter temperatures, happiness and warmth emanated from the Light and Love School in Shunyi on Dec. 9. 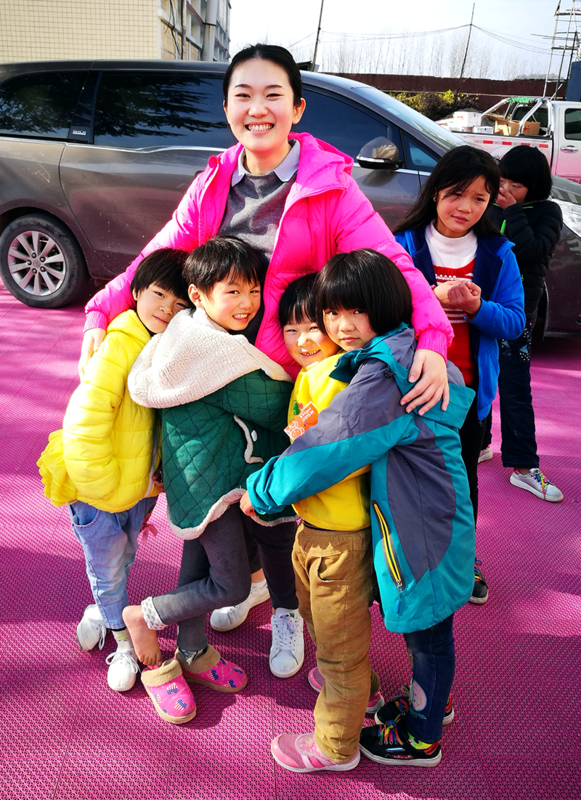 Inspired by the children’s smiles and hugs, more than 70 employee volunteers from ConocoPhillips China and their families participated in the annual Christmas event. This marked the 13th year that ConocoPhillips China has celebrated the holiday with the children. Volunteers organized mini sports contests, with more than 100 students and teachers participating. And, as always, Santa Claus delivered Christmas gifts to the children in celebration of this traditional Western festival. The nonprofit Light and Love School provides underprivileged and homeless students with education, accommodations and psychological support to help them grow into healthy, educated adults. 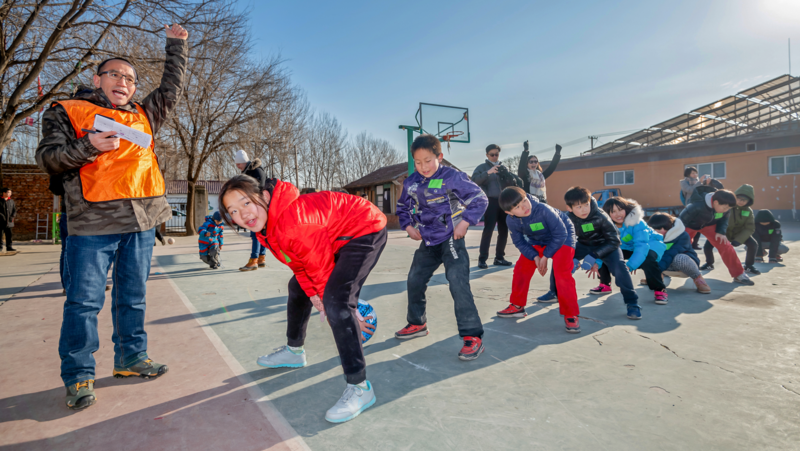 Since 2005, ConocoPhillips China has supported the school through volunteer services and donations that help provide classrooms, dormitories, medical care and other necessities. Volunteers and students demonstrate teamwork during a ball passing game. During the sporting events, 10 teams competed in ball passing, a chariot race, a kangaroo jump, basketball shooting and a tug-of-war. The party fostered interaction between participants and volunteers, generating laughter and happiness throughout the day. ConocoPhillips China President Bill Arnold was touched by the enthusiasm of the children and volunteers. “I hope we can bring them the joy of Christmas and warm their hearts, while also offering practical help,” Arnold said. 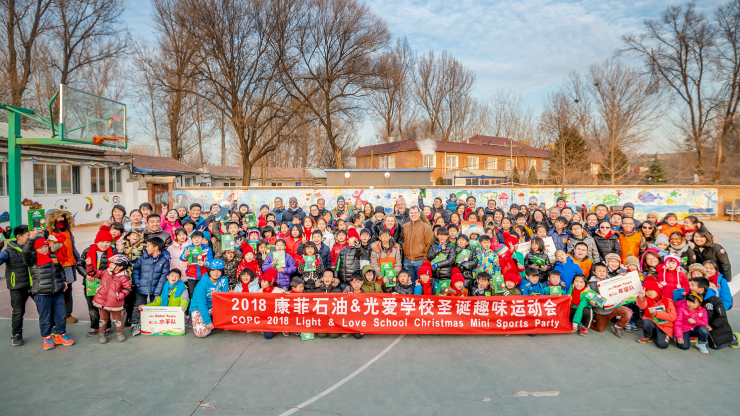 Mark Wheeler, the former president of ConocoPhillips’ China business unit who will be leaving China to retire from the company, has been a longstanding supporter of the Light and Love School. He said he would never forget the warm smiles of the children. 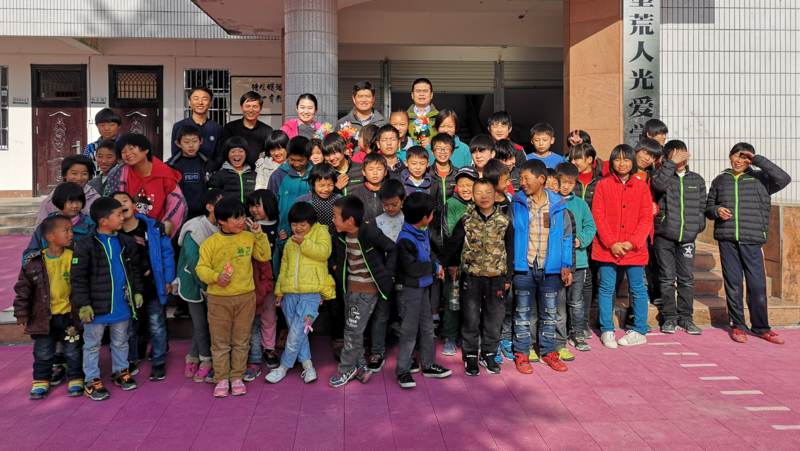 In addition to the annual Christmas event, ConocoPhillips China helps address challenges facing the Light and Love School, including maintaining suitable teaching and living conditions throughout the year. During exceptionally cold winters, the company donates funds to cover gas heating costs, ensuring the children are warm enough to learn effectively and live comfortably. Upon learning the school was short on funds to upgrade old equipment in its multimedia classrooms, ConocoPhillips China donated hundreds of computers and equipment to the Beijing campus and the Jinzhai campus in Anhui province. This helped improve the school’s education information technology capacity. ConocoPhillips China Vice President for Commercial & Government Affairs Yang Yumin recently visited the Jinzhai campus to learn about the school’s education program, engaging in in-depth discussions with the school’s principal regarding future support to the campuses.